It's one thing to have a nice-looking home from the outside. A lovely exterior design certainly boosts your home's curb appeal. But if it doesn't feel like home on the inside, what's the point? If you're unhappy with the interior of your home, it may be time to consider hiring a remodeling services company to renovate your living space in a manner that suits your needs and personal taste. 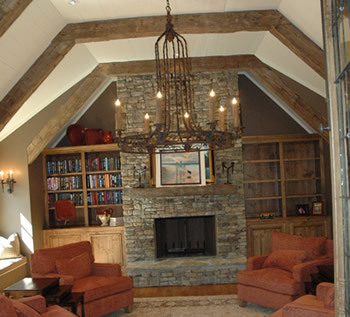 Brownlow & Sons offers a vast array of interior remodeling and construction services. We can renovate or install brand new components in your home from floor to ceiling. No matter what you need, we can take care of it. There is absolutely no reason why you have to suffer with a home interior you're dissatisfied with. Make a quick call to Brownlow & Sons and we'll provide you with a project estimate right away. Should you agree on the budget and timeline, we'll begin the installation and/or renovation process. Before you know it, your home's interior will look as good as new, or even better! Uncompromising standards of prep and finish work, the best products, project management and the Brownlow & Sons warranty are all included in all Brownlow & Sons Remodeling Jobs. We handle all different kinds of ceiling-related projects from ceiling repair to ceiling remodeling. And it doesn’t matter if you just need to have a few cracks repaired or need a comprehensive remodel of the ceiling to improve its structure. We also have an entire painting division, to ensure your ceiling looks as good as it possibly can. Regardless of your needs, we can provide the ceiling remodeling services you require to ensure a high quality, flawless result. Brownlow & Sons handles all different types of floor projects including wood and laminate flooring. So, if you need a wood floor contractor, we’ll be there for you. And if you need tile or a simple refinishing, we can do that, too.